It is one of the busiest of the British motorway network: the stretch between Junctions 14 and 15 outside Heathrow Airport consistently records the highest number of daily traffic counts on the British strategic road network with the average flow in 2017 of 211,059 counts (lower than the record peak measured in 2014 of 262,842 counts). This compares to 197,219 counts measured on the M1 motorway between junction 7 and 8 outside Hemel Hempstead in 2014, and 195,325 counts measured on the M60 motorway between junctions 12 and 13 in Western Manchester, also in 2014. Originally built almost wholly as a dual three-lane motorway, much of the motorway has been widened: to dual four lanes for almost half, to a dual five-lanes section between junctions 12 and 14 and a dual six-lane section between junctions 14 and 15. Further widening is in progress of minor sections with plans for managed motorways in many others. To the east of London the two ends of the M25 are joined to complete a loop by the non-motorway A282 Dartford Crossing of the River Thames between Thurrock and Dartford. This crossing, which consists of twin two-lane tunnels and the four-lane QE2 (Queen Elizabeth II) bridge, is named Canterbury Way. Passage across the bridge or through the tunnels is subject to a toll, its level depending on the kind of vehicle. This stretch being non-motorway, it allows traffic, including that not permitted to use motorways, to cross the River Thames east of the Woolwich Ferry; the only crossing further to the east is a passenger ferry between Gravesend, in Kent, and Tilbury, in Essex. However, in 2017 Highways England published plans to build another motorway-grade Thames tunnel to the east of Gravesend and Grays, the Lower Thames Crossing, in order to relieve congestion on the A282 Dartford Crossing and connect the M25 at North Ockendon in Essex with the M2 in Kent. The idea of an orbital road around London was first proposed early in the 20th century. An outer orbital road around London had first been proposed in 1913, and was re-examined as a motorway route in Sir Charles Bressey's and Sir Edwin Lutyens' The Highway Development Survey, 1937. Sir Patrick Abercrombie's County of London Plan, 1943 and Greater London Plan, 1944 proposed a series of five roads encircling the capital. The northern sections of the M25 follow a similar route to the World War II Outer London Defence Ring, a concentric series of tanks and pillboxes designed to slow down a potential German invasion of the capital. Little was done to progress these plans until the 1960s when the Greater London Council developed its London Ringways plan consisting of four "rings" around the capital. Sections of the two outer rings – Ringway 3 (the 'M16 motorway') and Ringway 4 – were constructed in the early 1970s and were integrated into the single M25 orbital motorway. But the Ringways plan was hugely controversial owing to the destruction required for the inner two ring roads, (Ringway 1 and Ringway 2). Parts of Ringway 1 were constructed (including West Cross Route), against stiff opposition, before the overall plan was abandoned in 1973 following pressure from residents in the threatened areas. Construction of parts of the two outer ring roads, Ringways 3 and 4, began in 1973. The first section, between South Mimms and Potters Bar in Hertfordshire (junction 23 to junction 24) opened in September 1975 and was given the temporary general purpose road designation A1178 (a section of motorway-standard-road, originally the M16, which eventually was incorporated into the M25) was completed and operational before this. A Watford-avoiding route between the M1 and the A40 between north Watford and Denham was locally known as the Croxley Green/Rickmansworth bypass, and was operational about 1973/4; a section south of London (junction 6 to junction 8) opened in 1976. A section of Ringway 3 south of the river between Dartford and Swanley (junction 1 to junction 3) was constructed between 1974 and 1977. In 1975 the plans for Ringway 3 were modified to combine it with Ringway 4, the outermost Ringway. 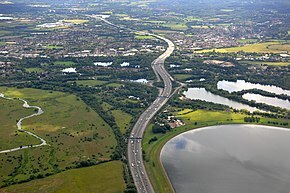 The M25 as a component of ringway 4, was first conceived to be an east-west road south of London to relieve the A25, and running parallel to it, with its eastern end following the route of what is now the M26. However, it was subsequently routed northwards towards the Dartford Tunnel to form, in conjunction with similar roads, including the M16 planned to the north of London, part of the London Orbital. The combined motorway was given the designation M25 which had originally been intended for the southern and western part of Ringway 4 and the M16 designation was dropped. The section of Ringway 3 west of South Mimms anti-clockwise around London to Swanley in Kent was cancelled. The stages were not constructed contiguously but in small sections. As the orbital road developed the sections were linked. Each section was presented to planning authorities in its own right and was individually justified, with almost 40 public inquiries relating to sections of the route. Maps at this time depicting these short sections named the route as the M16 but this changed before completion. In December 2016 Highways England completed the capacity project at Junction 30 (Thurrock) as part of the Thames Gateway Delivery Plan. M25 around London: Average daily traffic of 263,000 vehicles a day recorded in 2014 between junctions 14 and 15 near London Heathrow Airport. A4 motorway (Paris): 257,000 vehicles a day recorded in 2002. The M25 (including the A282 Dartford Crossing) is known for its frequent traffic jams. These have been the subject of so much comment from such an early stage that even at the official opening ceremony Margaret Thatcher complained about "those who carp and criticise". The jams have inspired jokes (e.g., "the world's first circular car park", "the London Orbital Car Park", "the biggest Car Park in Europe") and songs (e.g., Chris Rea's "The Road to Hell"). The M25 plays a role in the comedy-fantasy novel Good Omens, as "evidence for the hidden hand of Satan in the affairs of Man". The demon character, Crowley, had manipulated the design of the M25 to resemble a Satanic sigil, and tried to ensure it would anger as many people as possible to drive them off the path of good. The orbital nature of the motorway, in common with racetracks, lent itself to unofficial, and illegal, motor racing. At the end of the 1980s, before the advent of speed enforcement devices, owners of supercars would meet at night at service stations such as South Mimms and conduct time trials. Times below 1 hour were achieved - an average speed of over 117 mph (188 km/h), which included coming to a halt at the Dartford Tunnel road user charge payment booths. ^ "GB Road Traffic Counts". data.gov.uk. ^ "New Lower Thames Crossing to cut congestion and create thousands of jobs". www.gov.uk. ^ a b "M25 in South East Region". The Motorway Archive. 2009. (Select "M25" from list of motorways, then "M25 interchanges, tunnels and bridges"). Retrieved 18 April 2013. ^ This move would be bound to be resisted by the communities affected, including such major towns as Watford, Loughton and Epsom. The M25 is called “The Worst Road To Go To” according to many Londoners and Visitors. London Assembly Archived 9 October 2008 at the Wayback Machine – Poll says M25 is London's "natural boundary". 2 March 2004. ^ Communications Act 2003, The National Archive, 2003, retrieved 5 September 2011 that requires "a suitable proportion of the programmes made in the United Kingdom" to be made "in the United Kingdom outside the M25 area", defined in Section 362 as "the area the outer boundary of which is represented by the London Orbital Motorway (M25)". ^ "M25 MSA New Barn Farm Cobham". Highways Agency. Archived from the original on 3 March 2010. Retrieved 14 August 2010. ^ "Cobham M25 service station opened". BBC News. 13 September 2012. Retrieved 13 September 2012. ^ "Motorway traffic up 4% on 2003". BBC News. 12 August 2004. Retrieved 3 January 2009. ^ J. F. Bramley (1946). Roads for Britain: a digest of plans of future highways (2nd ed.). Staples Press. p. 14. ^ Smith 2001, p. 148. ^ John Henry Forshaw, Sir Patrick Abercrombie (1943). "County of London plan". London County Council: 13. ^ Hamilton 2015, p. 19. ^ "Hansard 3 December 1990 Written Answers (Commons) Transport". ^ "The bluffer's briefing on: The M25". The Independent. London. 24 March 1993. Retrieved 12 May 2010. ^ Webster, Ben (25 June 2009). "Rising costs put the brakes on dozens of roadbuilding projects". The Times. London. Retrieved 12 May 2010. ^ "M25 scoop for Balfour in Surrey". ^ "Case Study – M25 Controlled Motorway". Highways Agency. Archived from the original on 11 February 2010. ^ Wolmar, Christian (4 April 1995). "The roadblock that became a bandwagon". The Independent. London. Retrieved 12 May 2010. ^ Cohen, Nick (2 April 1995). "Pointless lies that reveal so much". The Independent. London. Retrieved 12 May 2010. ^ Wolmar, Christian (21 March 1997). "Minister gives green light to widen M25". The Independent. London. Retrieved 12 May 2010. ^ "Plans to widen M25 to 12 lanes under attack". Archived from the original on 5 April 2012. ^ "BAA makes plans for Terminal 5 despite inquiry". ^ "M25 Junctions 12 – 15 Widening". Archived from the original on 5 September 2011. In 2003, Balfour Beatty Civil Engineering was awarded the £148 million contract to widen the 10-mile stretch of the M25, between Junction 12 (the M3 Interchange) and Junction 15 (the M4 Interchange). ^ "M25 Jct 12 to 15 Widening". Highways Agency. Archived from the original on 26 September 2008. ^ "£75 MILLION REFURBISHMENT FOR M25 HOLMESDALE TUNNEL AND JUNCTION 25 IMPROVEMENT WORK STARTS ON SATURDAY 6 May". Highways Agency. Archived from the original on 6 November 2008. ^ "M25 Junction 28 / A12 / Brook Street Interchange". Highways Agency. Archived from the original on 26 September 2008. ^ "Prequalification Document". Highways Agency. Archived from the original on 7 November 2008. Retrieved 20 January 2008. ^ "Highways Agency announces shortlist for £4.5bn M25 DBFO". Contract Journal. Archived from the original on 16 January 2016. Retrieved 20 January 2008. ^ "Cost escalation hits M25 widening benefit to cost ratios". ^ Helm, Toby (18 January 2009). "Ministers scrap plan to widen motorways". The Guardian. London. Retrieved 12 May 2010. ^ Webster, Ben (20 May 2009). "PFI deal for M25 agreed despite price rise". The Times. London. Retrieved 12 May 2010. ^ "£6.2 billion M25 Design, Build, Finance and Operate (DBFO) contract awarded". Highways Agency. Archived from the original on 15 November 2009. ^ "M25 Jct 16 to 23 Widening". Archived from the original on 22 September 2009. ^ "M25 widening to four lanes begins". BBC News. 8 July 2009. Retrieved 12 May 2010. ^ "Highways Agency Timetable". Archived from the original on 26 September 2008. ^ "Weekly Summary of Roadworks in M25 Sphere – 30 September 2009". Archived from the original on 2 October 2009. Retrieved 11 October 2009. ^ "M25 Jct 27 to 30 Widening". Archived from the original on 4 October 2009. ^ "M25 Junctions 5 to 7 Managed Motorways". Archived from the original on 8 September 2012. Retrieved 11 October 2009. ^ "M25 Junctions 23 to 27 Managed Motorways". Archived from the original on 17 August 2012. Retrieved 10 December 2008. ^ "Dartford River Crossing Study into Capacity Requirement" (PDF). Department for Transport. 20 April 2009. Archived from the original (PDF) on 19 July 2009. Retrieved 26 April 2009. ^ "Transport Scotland – M74 Completion Project". Archived from the original on 18 December 2009. Retrieved 6 September 2009. ^ "Compte Rendu Analytique Officiel de la Seance du 17 Decembre 2002" (in French). ^ Lezard, Nicholas (21 September 2002). "Meandering round the M25". The Guardian. ^ "Chris Rea interviewed by Will Hodgkinson, The Guardian, Friday 13 September 2002". London. 13 September 2002. Retrieved 31 January 2009. ^ Pratchett, Terry; Gaiman, Neil (1993). Good Omens. London: Corgi Books. p. 19. ISBN 0552137030. ^ Neil Gaiman (11 April 2003). "Neil Gaiman's Journal". HarperCollins. News Corp. Retrieved 25 March 2017. ^ "Orbital information". Archived from the original on 15 February 2011. Retrieved 28 January 2011. ^ May, James (20 October 2007). "Speed, Greed And The M25". BBC Radio 4. ^ "Programme Information – Network Radio Week 43" (Press release). BBC Press Office. ^ a b c "M25 Road Network Driver Location Signs" (PDF). Highways Agency. Archived from the original (PDF) on 5 June 2011. Retrieved 9 June 2009. This page was last edited on 11 April 2019, at 17:50 (UTC).